Strathfield Musical Society (formerly Strathfield Light Opera Company) was founded in 1968. Our first show was ‘Land of Smiles’. In 1988 we became Strathfield Musical Society (SMS) Inc. The change of name reflected our new incorporated status and the fact that we perform musicals as well as light opera. SMS receives no financial assistance or sponsorship from outside sources (although we are very receptive to the idea)! Of course, not all assistance has to be financial. We gratefully acknowledge and thank all those who support us by donating their time and talents to our endeavours. SMS has been bringing quality entertainment to audiences in the Strathfield area for more than thirty years. But what you may not realise is that you could become involved too! The Society offers its members the opportunity to learn about and experience the thrill of performing. 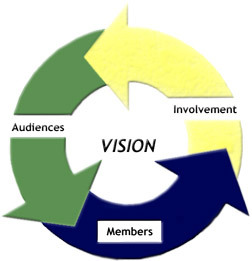 For those who do not wish to do that however, the Society also needs committed people interested in stage management/crewing, set design/construction, front of house sales, marketing, wardrobe, production design, musicians and a range of administrative tasks that go with an organisation such as this. Most importantly though, we are a family. Over the years, members have formed very close ties and associations and it is the experience of anyone who joins that they very soon find they are an integral part of a close knit group. Strathfield Musical Society’s vision is to enhance the community by staging theatrical productions which attain the highest levels of artistic achievement and provide quality entertainment at affordable prices. Providing our audiences with the opportunity to experience musical theatre that is accessible at the community level as well as providing value for money and professional standards in entertainment. The community’s involvement both before and behind the scenes, is crucial to the longevity of the Society. The Society will operate in such a way that community participation in all facets of musical theatre will be welcomed and encouraged. The Society will strive to create an environment that fosters professionalism, mutual respect and tolerance and social interaction for participating members of the community. It will also provide an outlet to showcase their talents and allow them to grow and to reach their potential in their chosen facet of theatre. The Constitution provides vital information to members about the structure and operation of the Society. Along with our Vision Statement and By-Laws, this forms the “Model Rules” which every Incorporated association is required to have in place according to the Associations Incorporation Act 1984. The Vision Statement and Constitution have been approved by the Department of Fair Trading. © Strathfield Musical Society Inc.